In a move to keep its staff happy, IndiGo recently hiked the pay of its staff, including those of its captains, senior first officers, first officers, junior first officers, as well as cabin crew. While a captain’s gross pay has reportedly been hiked in the range of 15%, the cabin crew’s pay has close to doubled. The salary hike is effective from the month of December, and serves to bring cheers to crew members who have, reportedly and apparently, felt that they have given the company their all, working to help push the airline to profits, but haven’t received a hike for “so many years”. Many approachable, polite and fair-playing management pilots have apparently resigned, to the dismay of many pilots. An IndiGo management pilot has moved to Air Asia India, making him the first IndiGo pilot to join the flight deck staff at the regional low cost carrier that is yet to start domestic operations in India. IndiGo is a well performing airline, if one is to look at their load factors (the highest average in the country), their fleet, and the reported profits. All is well till competition sets in. Aditya Ghosh, CEO of IndiGo, had told Business Standard, “I don’t lose sleep over AirAsia”. But there may be reason. Not certain, but strong, to lose sleep. Many pilots are willing to accept INR 20,000-30,000 lower gross pay per month, if they are promised a better work culture, in line with what Air Asia offers today, to its staff. Say many, if offered the same or even a slightly lesser salary, they’re willing to leave their airline for Air Asia, if they feel they can go to work happy. To many line captains, happiness is worth more than approximately INR 4,00,000 per year. Finally, happiness has a price tag. Aditya Ghosh is known to be dynamic. He is known to interact freely with his employees, and he set off a new trend in the Indian airline industry: being funny, sometimes witty, and doing many things pleasingly different. With Mittu Chandilya stepping in as the face of Air Asia India, the spotlight is now shared and slowly shifting to an impressive former model who is seen with sport cars; among young students at universities of repute; playing cricket with his staff; personally attending certain cabin crew selections; first hand observing operations at the airline; promoting causes; and importantly, running his own Facebook page for fans to follow. While Aditya Ghosh’s spotlight-shyness is respected, Mittu’s emergence into the spotlight, not necessarily to talk about himself, sets the latter apart. Infact, it propels Mittu’s image, and consequently the airline’s image, to a new level: run by confident, open men who love not fun, but loads of it, while not compromising on what matters: work, safety, and the people who run the airline. Whether this will actually translate into how the airline is run is hard to tell, yet, but most are willing to take the chance. It’s not just the money. It’s the promise of a satisfying, fair, and exciting work culture coupled with the dynamism of a CEO who’s a natural in pleasing and leading, possibly reflecting what the airline may turn out to be. Ofcourse, a lot goes into the operational success of an airline, but small yet important things like an impressive leader, and good work culture can help with staff loyalty, something which is definitely part of any company’s definition of success. Almost a year after the first Airbus A320 equipped with a sharklet was delivered, Airbus announced the launch of the sharklet retrofit program for in-service A320 aircraft, and will be available in 2015. This retrofit includes reinforcing the wing structure and adding the Sharklet wingtip device. As part of the upgrade, the retrofit will lengthen the aircraft’s service life and thus maximise the operators’ return on investment for the Sharklet retrofit. The extent of reinforcement and more details on the sharklets may be viewed here, in this comprehensive article on Winglets and Sharklets. Airbus will offer the retrofit initially for A320 and A319 models and will evaluate a retrofit for the A321 at a later stage. The Sharklets’ benefits include a fuel consumption reduction by up to 4 per cent (Only on long sectors), and an extension of mission range by 100 nautical miles or payload capability increase by up to 450 kilogrammes. 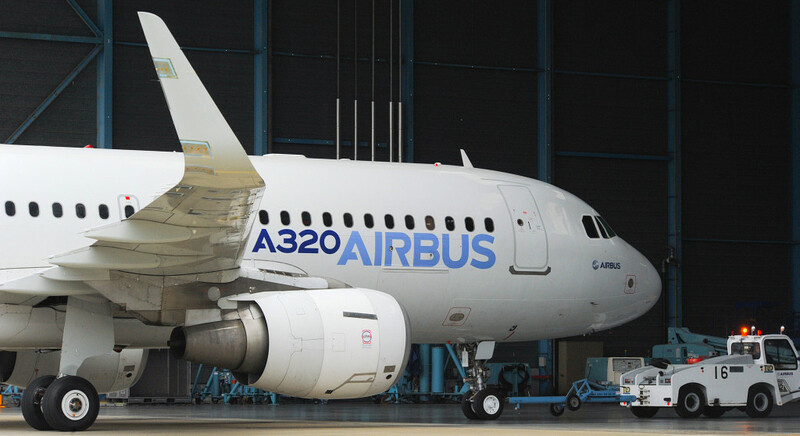 Sharklets equipped on new-build A320 Family aircraft have been delivered by Airbus since December 2012, with more than 184 received by customers and operators to date. MSN 5428 is the first sharklet equipped Airbus A320. In India, only two operators of the Airbus A320 feature sharklet equipped A320s in their fleet: IndiGo and GoAir. In Indigo, VT-IFH onwards, up to the latest, VT-IFV feature sharklets. Out of 71 Airbus A320 in the airline’s fleet, 15 are equipped with sharklets. In Go Air, VT-GOL onwards, up to the latest, VT-GOP feature sharklets. Out of 18 Airbus A320 in the airline’s fleet, 5 are equipped with sharklets. There are 112 Airbus A320 in India (excluding A321 and A319), 17.8% of which are equipped with fuel-saving sharklets. Project Airbus Tech: More than just an update! Project Airbus Tech (PAT) is just 5 chapters away from covering the entire Airbus A320. PAT has been extremely useful for pilots who have needed a technical refresher, a review before sims, those headed for the type rating, and has also been useful to those who have appeared for their Command interview. PAT has never failed to help Airbus A320 pilots who have seeked help on the airplane’s systems. CLICK HERE to access PAT. Even more interesting is the man behind PAT’s execution: Sushank Gupta. Sushank was one among 20 IGRUANs who appeared for the written test conducted by CAE for the “CAE-IndiGo assessment A320 Type Rating Program”. The test was conducted over 3 days, between the 16th and the 18th of April 2012. 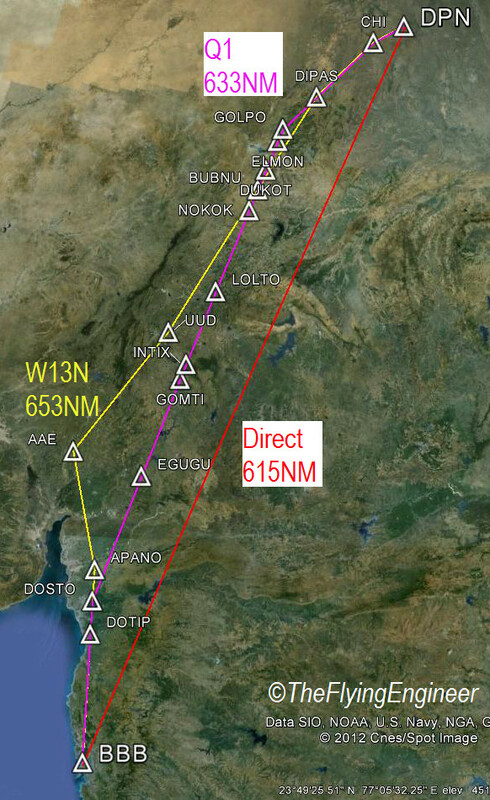 Sushank appeared on the 16th, and that was when the Flying Engineer met Sushank for the first time at Bangalore. Having cleared the written, the interview was finally conducted, after a year and four months of the written, on the 16th of August, 2013. On the 8th of September, 2013, Sushank was sent an email from IndiGo informing him having successfully cleared the interview , and the hard copy of the Letter Of Intent having been dispatched by IndiGo. Sushank is on his way to an approximately 10 week long type rating program, which will be held either at Madrid, Dubai, or Bangalore. The first round in this entire process consisted of a written test: the aviation knowledge test. This was followed by a second round, which is the CASS: The CAE Crew Assessment and Selection System. The CASS consisted of a personality evaluation, an informal interview, an English test on spoken and comprehension, psycho-motor tests involving basic flying skills that also test the examinee’s abilities to multitask and process information in a stressful environment. The third and final round consisted of a Group Discussion (GD) followed by an interview. Those on the interview panel included the Vice President: Flight Operations at IndiGo Airlines; Examiner on the A320 and Chief Pilot, Flight Operations, IndiGo Airlines; and the Vice-President of HR, IndiGo. The Type rating Program will cost US$ 34,500, which is approximately INR 21 Lakhs. Sushank will immensely benefit from Project Airbus Tech. The Airbus A320 is a complex airplane that requires a deep understanding of the airplane. 10 weeks is too short a time to master the airplane, but Sushank’s efforts on PAT will pay him rich dividends in mastering the 320 earlier than his peers. IndiGo’s parent company, Interglobe Enterprises, and CAE-Airbus had “broken ground” in the November of 2011 to establish a new pilot and maintenance technician training centre in Delhi. The new centre, located specifically in the Greater Noida Industrial Area, about 40 kilometers southeast of Delhi, is not for the exclusive use of IndiGo airlines, but rather for airlines in India and the neighbouring region. The focus of the new Delhi training centre will be to provide “wet” and “dry” type-rating, recurrent, conversion and jet indoctrination training for commercial aircraft pilots. Programs will also be offered for maintenance technicians. The Delhi training centre was planned to initially house four full-flight simulators and was planned to accommodate eight simulator bays. Training technology such as CAE Simfinity multimedia classrooms, computer-based training and brief/debrief facilities are used. Although planned to house 8 full flight simulator bays, the new centre has only 6 full flight simulator bays, with which it plans to “train 5000 professionals per year”. The Full Flight Simulator facility at Bangalore has 3 simulator bays (Two A320 and one B737NG), with the capacity to train 1500 crew members annually. This figure boils down to 500 crew members per FFS per year, leading the Delhi centre to train a maximum of 3000 crewmembers annually. Of the six simulator bays, only 2 are occupied, at the moment, by two CAE Series 7000 A320s level D simulators, which can handle a maximum of 1000 crew members, annually, until more simulators are added. 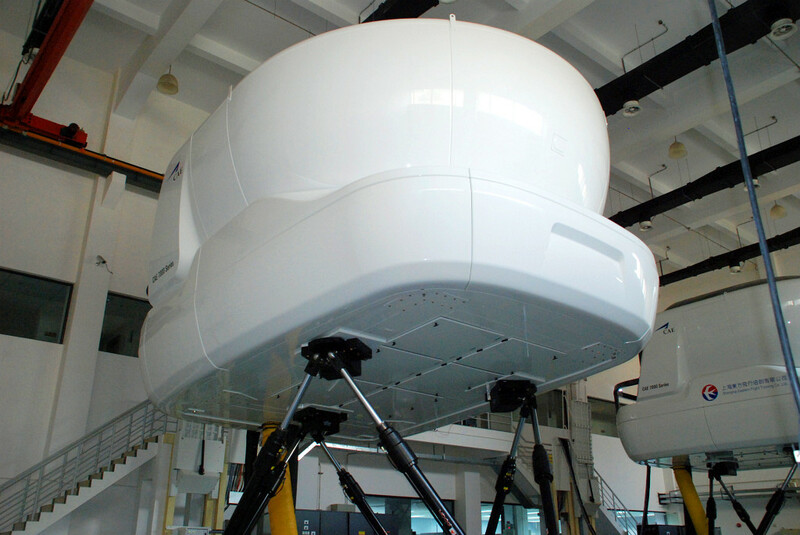 This simulator facility marks CAE’s 5th training centre in India, after the CAE FFS centre and CAE “Hatsoff” Helicopter Simulator facility at Bangalore, Praful Patel’s flight school: National Flying Training Institute NFTI bat Gondia, in which CAE has 49% stake, and IGRUA, which is doled out a step-motherly treatment by CAE considering its low stake and low control over operations at the premier flight institute in India. The new simulator facility takes the total fixed wing Full Flight Simulator count, in India, to 13, comprising of eight A320, four B737NG, two B777, one B747, one B787, and one A330. 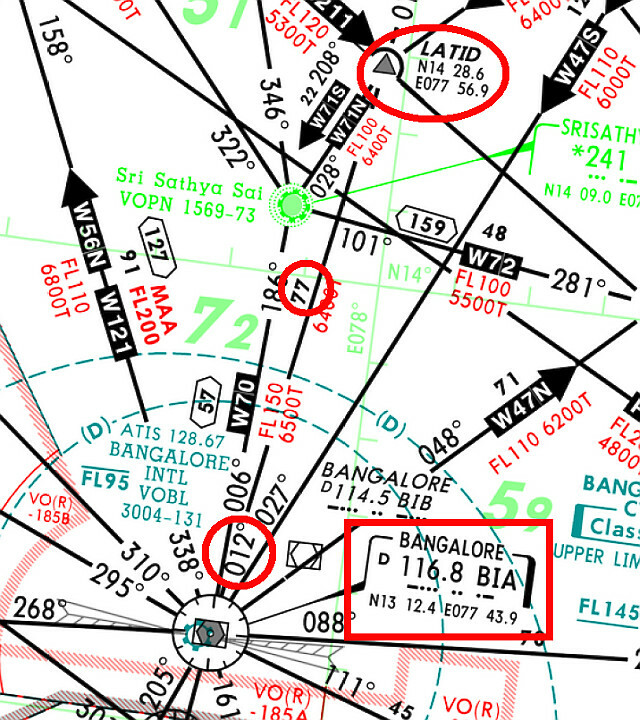 These simulators are spread out across India, at CAE Bangalore (2 A320, 1 B737NG), CTE Hyderabad (3 A320), FSTC Delhi (1 A320, 1 B737NG), Jet Airways Mumbai (2 B737NG, 1 A330, 1 B777), and Air India Mumbai (1 B737NG, 1 B747, 1 B777, 1 B787). The new centre takes CAE’s total to about 70 Airbus full-flight simulators in more than 20 locations worldwide. CAE operates the largest network of Airbus simulators. Indigo Airlines’s President & Executive Director, Aditya Ghosh, interviewed at NASSCOM India Leadership Forum 2013, had to say a lot on what he thought of the airline business. I believe that every pilot should read excerpts of what I believe are important, to understand that there may be a boom, but there may be a slump as well, if an airline is not well run. What is it that Indigo saw? What is the matter with Indian Aviation? Is the problem with the regulations? Why are there so few airlines in India? Make My Trip’s Challenge. Unfortunately, they couldn’t offer the lowest, as they promise. 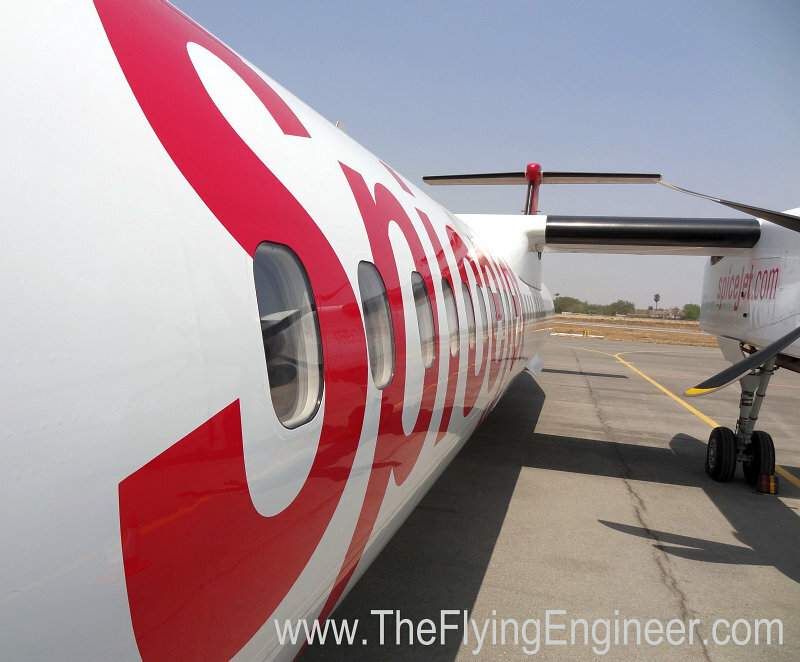 TheFlyingEngineer Update: A kind Spicejet FO pointed me out to Akbar Travels, which offer truly low airfares! Please do check out the last screenshot right at the bottom of this short article. Akbar travels’ low airfares, which are the lowest for all airlines and all flights that I searched for Mar 30 2013, are definitely worth a note! MakeMy Trip dot com is strong in its advertising. It claims to bring you the cheapest fares, if not, it will pay you double the difference in fare. I wanted to see which method, and which site got me the cheapest of tickets. 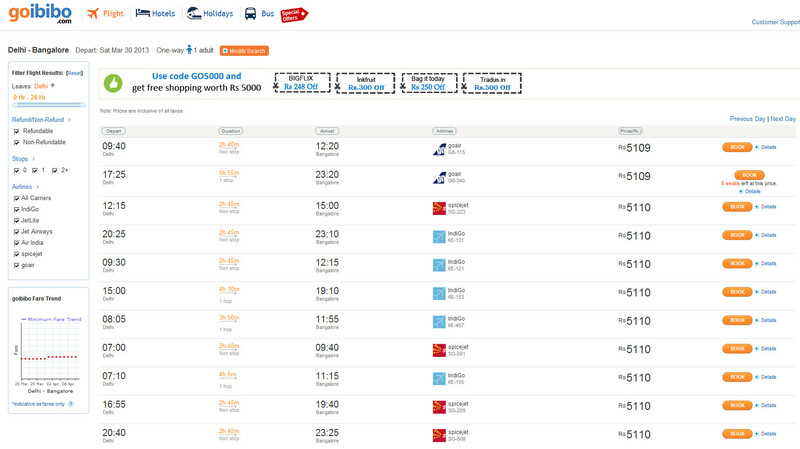 (and see the screenshots below: MakMyTrip couldn’t stand up to their own test). I tried these five sites: Indigo, Spicejet, MakeMyTrip, Ixigo, Goibibo and Cleartrip. Why these six? The first two to see how much the “Major Low Cost” airlines charge, and the last four as these are very “well branded”. 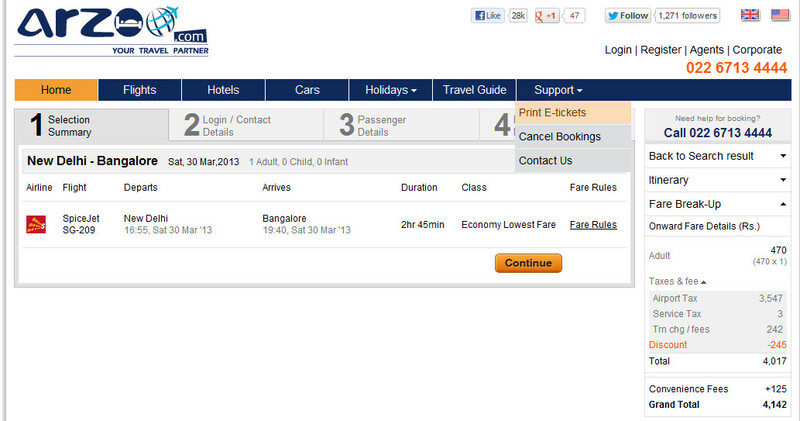 I set my departure date as 30th March, 2013, for a one-way flight from Delhi to Bangalore. Cheapest was my only criteria, not the flight time, time of flight, or OTPs, and I relied on the airline / website to filter my results as lowest fare first. 1. The flight fare of Indigo and Spicejet are the same, for the date in consideration in this case. 3. 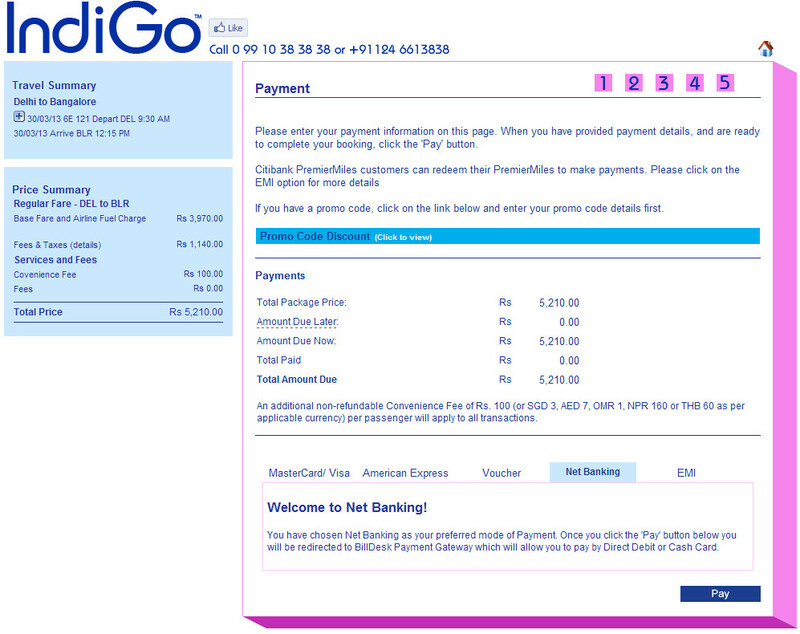 MakeMyTrip, Cleartrip, Ixigo/Arzoo*, and Goibibo charge a convenience fee of INR 125 per passenger. So if you’re booking a ticket early, through any of these sites, then you’ll stand to lose INR 25 when booking an Indigo flight, and INR 125 when booking a Spicejet flight! 4. Arzoo did the best job. 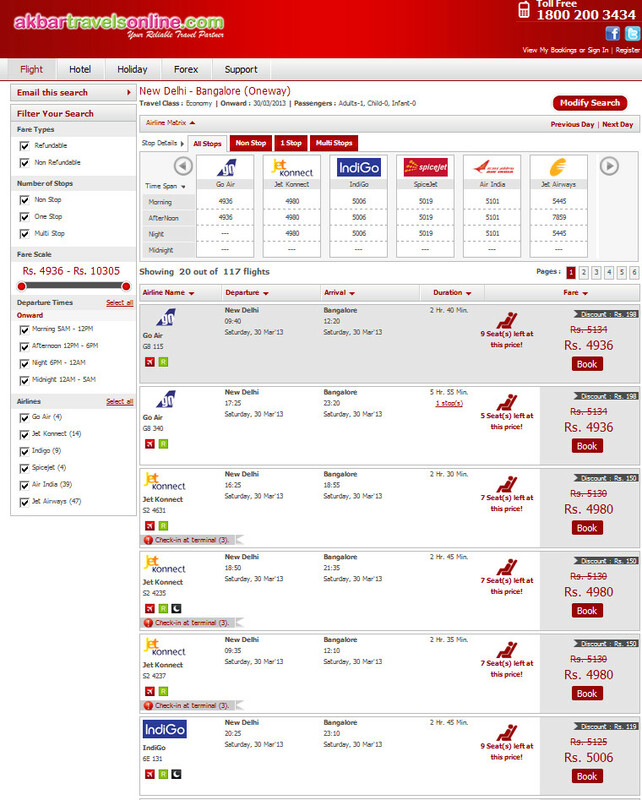 *Now, a search on Ixibo led me to Arzoo, and Arzoo gave me by far the cheapest flight: Spicejet, INR 4017. With the “Conveninece fee” of INR 125, this came up to 4,142, which is still a good INR 1,068 cheaper than the lowest you can expect from Indigo! Look at all my screenshots below. Read the captions carefully. So when booking a flight, search everywhere, and know that those “promise-you-the-lowest” sites may actually prove to be costlier than the airline’s parent site! Moral: Search well before buying. 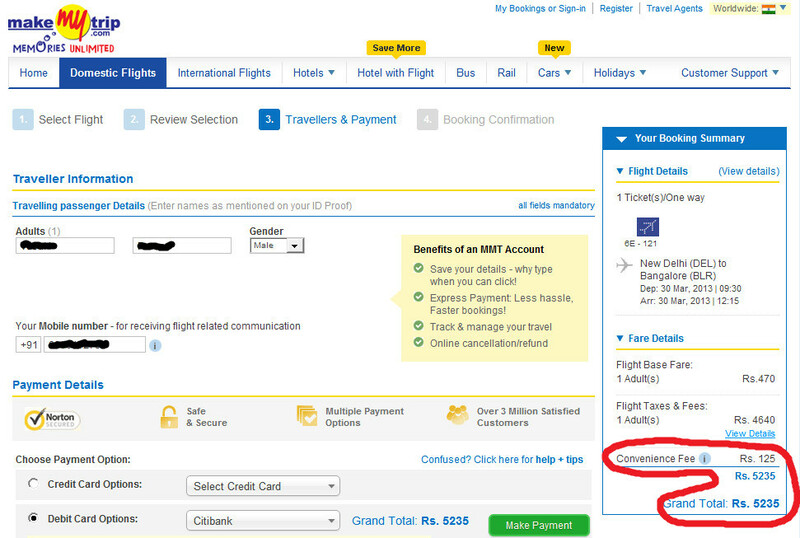 As for MakeMyTrip, I wonder what they now have to say about the “lowest airfare challenge”: Here’s proof that they’re not always the lowest! 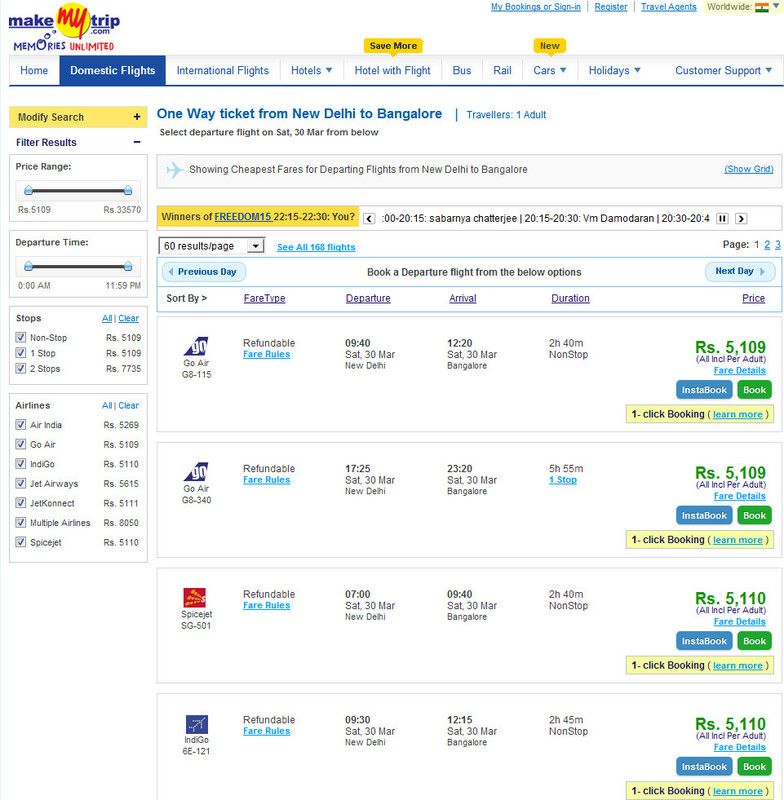 Indigo’s airfare, which is priced the same as Spicejet’s, is costlier by INR 100 when booking through their website, due to the “convenience fee” that they charge. 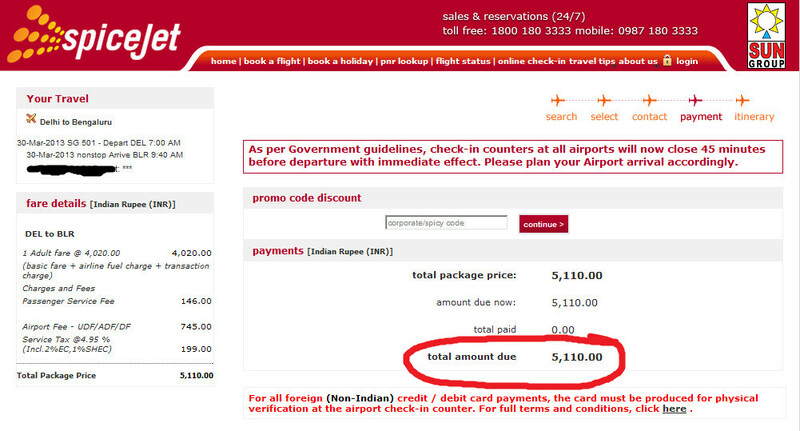 Spicejet’s fares are priced as much as Indigo’s, but the convenience fee of INR 100 isn’t charged. This makes their fare the lower than the competition’s. 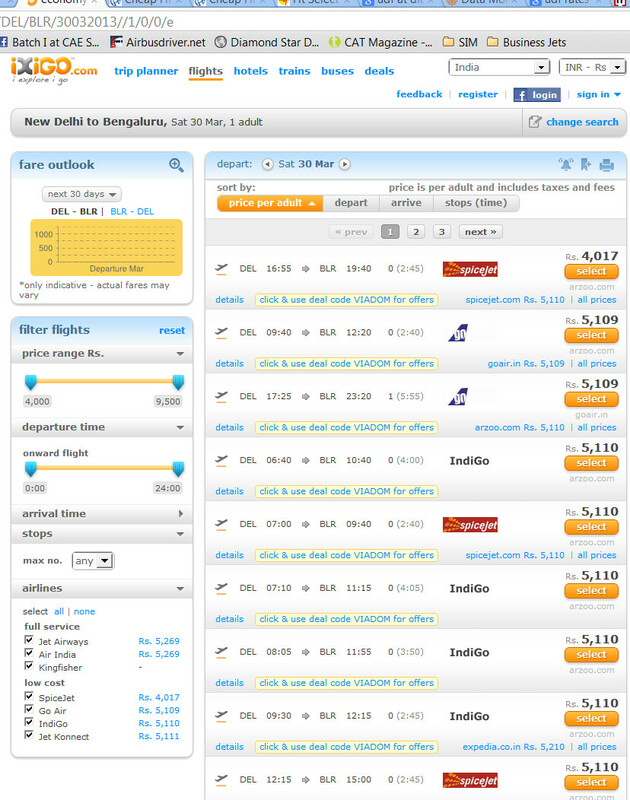 The Best Make My Trip could get me (from Indigo and Spicejet) was INR 5110, INR 1 costlier than Go Air’s fare. But add their convenience fee of INR 125, and you have INR 5235 to shell out. Even if you would have purchased Spicejet’s you’d have to pay the same: this is what all the websites charge: INR 125 on domestic! ClearTrip couldn’t do any better than the other sites. Ready to pay! NO, I didn’t purchase the ticket! Make My Trip’s lowest could not beat Ixigo’s. Wonder what I can do to benefit from the lost challenge! GoIbibo didn’t do any better than the others. Akbar Travels, which was brought to my notice today, had the lowest steady airfares on offer! What the Sharklets could mean for Indigo. Despite the advances in other areas, Airbus lagged behind when it came to wingtip devices. The conventional and all too familiar wingtip fences that we see on the Airbus A300s, A310s, A320s and the A380s did their job, but a scope for improvement always existed. The Airbus A330s and the A340s broke from the norm by employing conventional winglets, similar to the ones seen on a Boeing 747-400. On the 30th of November 2011, when the first ever A320 to be produced: MSN 0001 took to the skies, this wingtip complacency was relegated to a page in history. With the first flight of an A320 with “Sharklets”, the Airbus lingo for winglets, Airbus was ready to give to the world a much awaited confirmation and assurance of a winglet that will finally make its way to production aircraft. Vortices which result at the tips of wings as a result of the pressure difference that exists between the upper and lower surfaces of the wings induce a drag which reduces the wing’s aerodynamic efficiency. Winglets are small , nearly vertical aerodynamic surfaces which are designed to be mounted at the tips of aircraft wings. A properly designed winglet impedes these vortices, shifting them instead further up to the tip of the winglet, resulting in much weaker vortices. As a result, the induced drag is significantly reduced, improving the lift to drag ratio of the new compound wing structure. 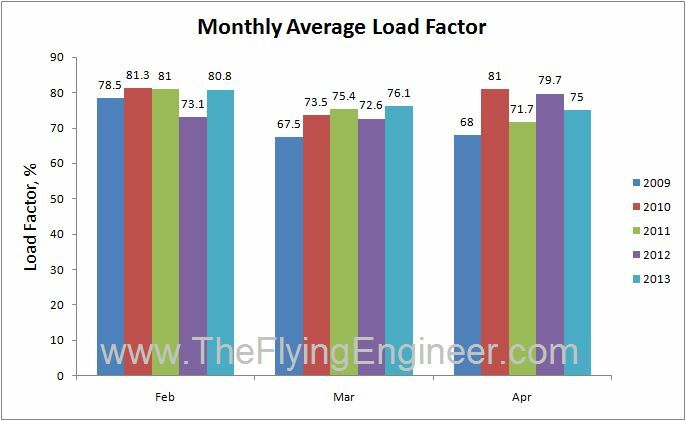 An increased lift to drag ratio implies lesser engine thrust requirement for a desired amount of lift, which directly relates to fuel savings. Like other winglets, these Sharklets bring with them a bundle of realistic promises, the biggest of which is a 3.5% fuel saving over 3000NM-long flying sectors, and around 1% fuel saving over 500NM long sectors, in comparison to A320s flying with the conventional wingtip fences. For an A320 operator like Indigo, which deploys its A320s on a mix of medium haul international and short haul domestic routes, the savings can be huge. Based on the flight schedule, Indigo can comfortably deploy one A320 on the Bangalore-Mumbai-Singapore-Mumbai-Bangalore pattern every day. Fuel cost at Bangalore and Mumbai have been approximated to be the same. Projected savings on a single A320. Fuel Prices as of Dec 25th, 2011. 3% fuel savings (assumed) used for 2000NM and 1% fuel savings (Airbus data) for 500NM. With this pattern, the same A320 operating with Sharklets can save about US$400,000 per annum on fuel related costs. According to John Leahy of Airbus, the price for the winglet will be similar to the forward fit, of around US$950,000, although the retrofit kit could add to the cost, though not substantially. A pair of Sharklets attached to an A320 flying the above pattern can pay back for itself in 2.5 years. Six A320s in Indigo’s fleet (INA-INF) are 5 years old. 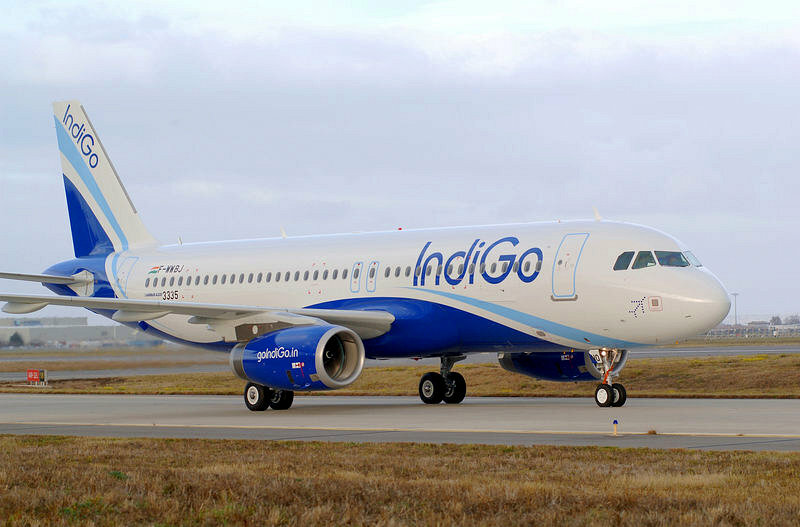 If Indigo plans to get rid of aircraft around 5 years old, a potential US$ 1M is saved by the airline, per aircraft. But these are not the only savings. Either the revenue payload can be increased by 500kgs, or the range can be extended by 100NM at the original payload. The increased lift to drag ratio of the wing will result in higher available takeoff weights, notably from obstacle-limited runways, and where runway performance is not limiting, operators could profit from a reduction in average takeoff thrust (with consequent savings in engine maintenance costs by around 2%). The Sharklets lend the aircraft a better takeoff performance and rate-of-climb, higher optimum altitude, higher residual aircraft value, and greater safety margins in the event of an engine failure. All these mean money for the operator.